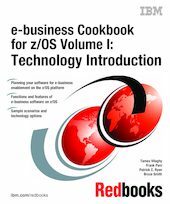 This IBM Redbooks publication is the first volume in the "e-business Cookbook for z/OS" series. It provides an overview of e-business and how it relates to zSeries and its z/OS operating system. The technology portfolio on z/OS in the e-business enablement arena is growing rapidly. Multiple solutions are possible, each requiring a different set of products. In this book we define several scenarios, each using a different "style" of technology. The scenario you adopt is dependent on your strategy, the skills in your organization, and the functionality you need. Within that scenario, various technology options are available; your selections will depend mostly on the subsystems deployed in your organization. The other volumes in this series are e-business Cookbook for z/OS, Volume II: Infrastructure, SG24-5981, and e-business Cookbook for z/OS, Volume III: Java Development, SG24-5980. They address the implementation and configuration of the technology, and describe how to develop solutions.